The San Francisco Bay Area is the nation’s leader in sustainable energy and the nation’s runner up in Fortune 500 companies. That innovative, cutting-edge outlook so integral to San Francisco is exactly the kind of spirit that the attorneys at TicketCrushers are eager to bring to our clients. Proudly serving the entire Bay Area from our 15 locations, the courts and judges in this city are familiar with our diligent, aggressive lawyers. The attorneys at our San Francisco Law Firm are motivated to sort out your legal matters for you as we specialize in navigating the Bay Area Traffic Courts - as well as matters of traffic tickets, DUI, criminal law, personal injury, family law, and legal immigration matters. We have fifteen serviceable locations throughout the Bay Area, so you have convenient, reliable support no matter where you reside. Be in touch with us immediately so we can remedy your traffic dispute or relevant legal matter; the longer you wait, the more dismal the outcome will likely be. Call us now for a free consultation. (1) Exercise Your Legal Right to Fight Your Ticket, or (2) Just pay your ticket with or without traffic school*. If you delay too long, you will pay your full ticket cost, might get costly points on your license, plus face a $300 late fine. Ouch! So don't miss your limited-time chance to Crush That Ticket — contact us today. We know that your heart skipped a beat when you saw the red and blue lights in your rearview mirror. You got a little nervous when the officer asked you for your driver’s license, registration and proof of insurance. But the real discomfort started when you drove away with the traffic citation in your hand. Every time you think about that traffic citation, you start to wonder how much it will cost you in time, money, and frustration. Although paying the ticket seems simple enough, you know that paying the ticket might be the most expensive way to resolve the case, because you can hire a lawyer to exercise your legal rights. *For many tickets, traffic school is not an available option. 1. Volume. Our lawyers fight many, many tickets in every courthouse. Our lawyers are going to court anyway, so how about our lawyers fight for you while we are there! 2. Experience. We know the legal tactics that get tickets dismissed/reduced in court. Paying a traffic ticket often raises your auto insurance rates. In fact, points on your record often raise rates by well over $750! (See nerdwallet.com) We help clients avoid points 90% of the time. Is Ticket Crushers a reliable service? Well, our lawyers have crushed thousands of tickets! Ticket Crushers is a member of the Better Business Bureau, with an A+ rating! We also average five stars on Facebook, Google, and Yelp! Ticket Crushers or traffic school? (A) Ticket Crushers: We get tickets completely dismissed 60% of the time! And we get tickets reduced to no points and no traffic school an additional 30% of the time -- all for as little as $149, depending on the infraction! (B) Traffic school*: pay the full cost of your ticket and do an 8-hour, online, DMV-mandated course costing around $72 ($20 course fee plus $52 court fee). * For many tickets, traffic school is not even an available option. You simply call to speak about your ticket with one of our knowledgeable consultants at 866-TICKET-HELP with your details and payment information. Our attorneys go to court so you never have to. We update you at each step by email. Our lawyers go to court to fight your ticket, which usually requires multiple appearances. You just pay one flat rate. Our lawyers go to court constantly, so we don't mind going repeatedly on your ticket, since we will have other cases there that day, too. After we complete our work, we contact you about the result: We get tickets completely dismissed 60% of the time! And we get tickets reduced to no points and no traffic school an additional 30% of the time -- all for as little as $149, depending on the infraction! The courts are slow, and your case will be open for months as our lawyers fight it. But that's good news. While your case is open, insurance companies and the police do not know you ever got that ticket! With sixteen offices in Bay Area and surrounding region, we’re confident we will be able to accommodate your legal needs. Don’t pay that traffic ticket! Forget court hearings and avoid traffic school. 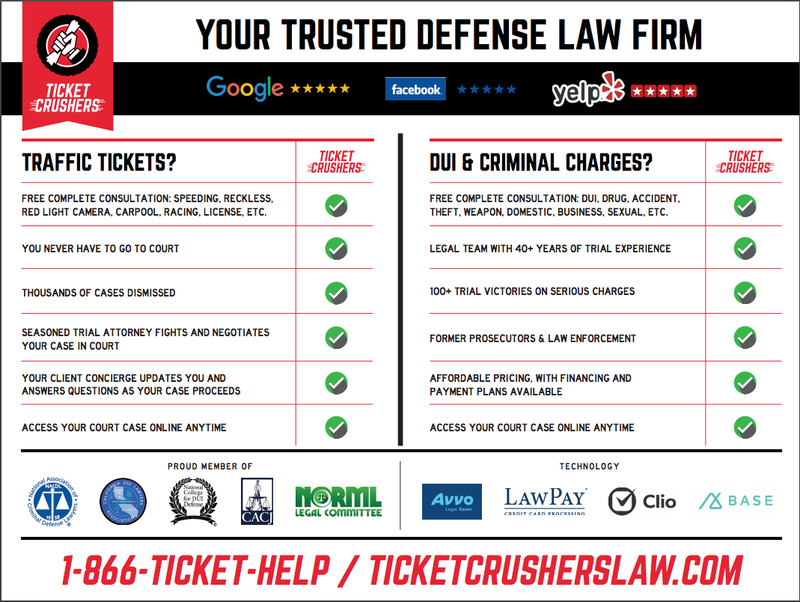 Just call the attorneys at Ticket Crushers and we’ll crush the ticket on your behalf. Don't pay the ticket; crush the ticket. The attorneys at Adam Cohen Law, A Law Corporation represent clients throughout the San Francisco Bay Area and Southern California for Driving Under the Influence ("DUI") charges. Whether your case involves a BAC reading of .08 or above or an alleged refusal to submit to testing, call us at 1 (866) 842-5384 to discuss the case. Cohen & Associates, PLC is experienced in fighting to suppress or exclude the results of a breath or blood test. Our seasoned attorneys provide a full service approach by fighting the DMV to determine if your driving privileges will be suspended on an administrative basis before the case even goes to court (often called the "per se hearing"). We also aggressively represent clients in the criminal case before the judge. That is important, because even for a person with no prior record, the statutory maximum penalties for a first-time DUI include a $1,000 fine, plus over $2,600 in penalty assessments, up to six months in jail, a six month driver's license suspension, vehicle impoundment, and a requirement that you install the dreaded ignition interlock device in your vehicle. The potential DUI penalties are even greater if your breath or blood alcohol concentration was over .15 or .20, you had a child passenger in the vehicle, you were involved in an accident with property damage, or you have a prior DUI-related conviction in California or any other state. The only way to avoid the statutory minimum penalties for a DUI is to hire an aggressive lawyer who can get the case dismissed or the charges reduced to a less serious charge such as reckless driving. Avoiding a DUI conviction can save you thousands of dollars in fines, court costs, and increased insurance premiums. It is also important to keep in mind that even if the case is reduced to reckless driving, all of the terms of the sentence still need to be negotiated, including whether the charge will be classified as a "wet reckless" or a "dry reckless." Your Adam Cohen and his legal associates, PLC attorney will work hard to negotiate the best possible resolution. An experienced drunk driving defense attorney in the San Francisco Bay Area, Valley and Coast will assert an effective defense suited to the particular facts of our case. Failure to Appear on a Violation of California's Vehicle Code. The attorneys at Adam Cohen and his legal associates, PLC represent clients in the counties of the San Francisco Bay Area, Central Valley and Coast for felony and misdemeanor criminal cases, as well as civil traffic infractions. At Ticket Crushers, Our offices are located on Geary Boulevard near Park Presidio in San Francisco, CA. We serve clients throughout the City of San Francisco and the surrounding areas including Alameda County, Santa Clara County, San Mateo County, and Contra Costa County, Solano County, Sonoma County, Marin County, and Napa County, CA. By focusing on criminal defense and the defense of traffic infractions in San Francisco and the surrounding areas, our seasoned attorneys can provide the most aggressive and effective defense possible. When you hire an attorney at Adam Cohen and his legal associates, PLC, you can have peace of mind knowing that an experienced attorney will go to court to fight your case. The California criminal defense attorneys at Adam Cohen Law, A Law Corporaton and its Ticket Crushers division fight cases in the Hall of Justice Building, located at 850 Bryant St., at all stages of the case including arraignments, preliminary hearings, motion hearings, probation violation hearings, and trials. The attorneys also represent clients in criminal cases heard at the Civic Center Courthouse located at 400 McAllister St., and the Community Justice Center, 575 Polk St. in San Francisco, CA. Our attorneys provide a free consultation either over the phone or in the office. Although our normal business hours are from 9 a.m. to 5 p.m., the phone is answered 24/7. Adam Cohen Law, A Law Corporation attorneys and legal associates are available to talk with you after normal business hours when needed. Call 1-866-842-5384 to discuss your case and find out what you need to do right now to protect your rights after a criminal accusation or a citation for a traffic violation.